On Saturday, November 11, 2017, Thembanathi will be participating for the first time in the Holiday Bazaar at Holy Trinity Church in Beaverton. The bazaar will feature more than 45 vendors, offering a variety of handmade and fair trade gifts, holiday decorations, and more. 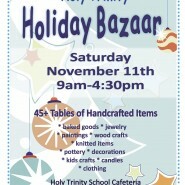 The bazaar will take place in the church cafeteria from 9:00 am to 4:30 pm. 13715 SE Walker Road, Beaverton. Thembanathi is a project of Even Ground. Learn more about Even Ground and their other projects on their website.